In this lesson, I will show you how to create an illustration of a hamster and then you will have the opportunity to see how adding different colors inside this cartoon character can help you end up with something completely different. Hamster are intriguing animals to illustrate. They have some interesting features that are not always easy to understand and sketched properly. That's why before proceeding with this drawing lesson, it can be a good idea to look at the image below to study this cartoon animal closely so that we can draw this one accurately later in the first part of this tutorial. The ear is created from a square shape and must be slightly pointed on top. Some hair can be drawn on top of the head. A large patch is added inside both ears. Eyes and pupils are created from large circular shapes. Small nose with a triangular shape. Arms are illustrated from small lines and simple details. Feet are done using several small triangles that are sharp and pointed. Notice how the bottom of the body is slightly curved. You can also add hair on the body. A large patch is sketched on the stomach of the animal. Another patch is also added inside the head. Yes, more hair can be drawn on the cheeks too! Good work! Hopefully this illustration of a hamster feels now more familiar and easier to illustrate. Don't forget that once this lesson is completed, I will show you a few alternatives using various colors. As you probably already know, adding a few basic shapes to help us create the character is always a great idea. 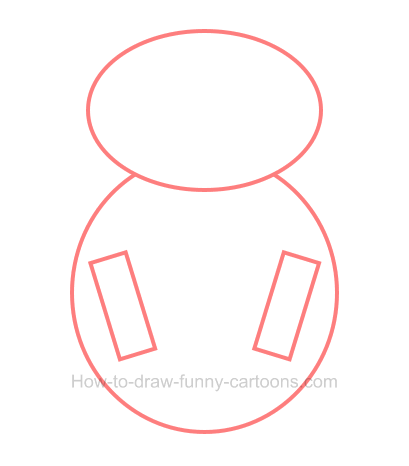 Let's start by drawing a large oval shape to represent the bottom of the head. The body is done using a larger circle. Finally, sketch two long rectangles to form the arms of the hamster. step 2 - more shapes are needed! 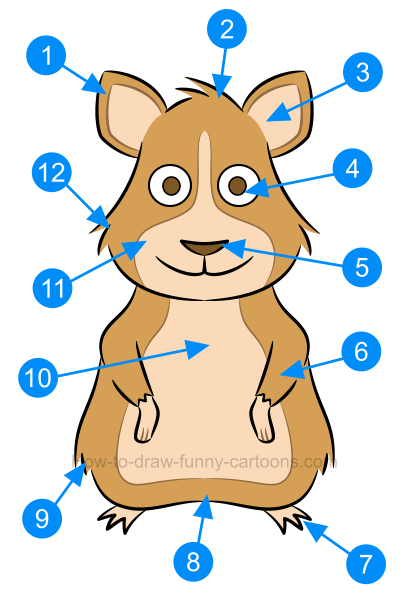 Since this illustration of a hamster is slightly more complex than usual characters, let's add more shapes to help us draw the perfect animal. On top of the oval shape used for the head, draw a long curved line to create the forehead. Two small squares are used for the ears. 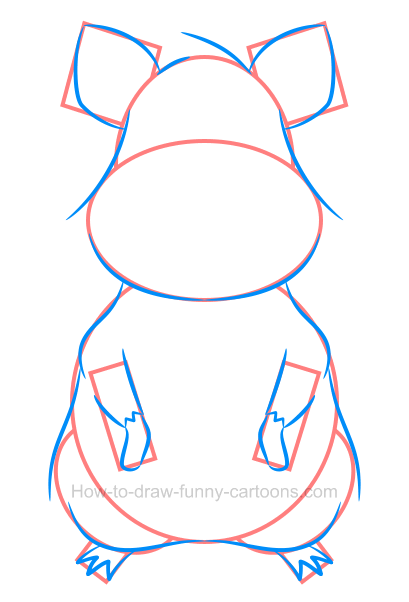 Complete this second step by adding long curved lines and small squares for the legs of the character. 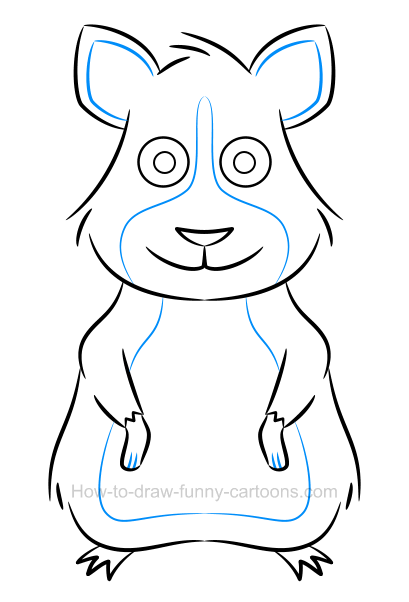 Using mostly curved lines, you can now draw the animal using the template created earlier. Notice areas like the hands, the elbows, the hair, the ears and the bottom of the body. Once you are done with this part of the lesson, you can erase all shapes that are made with an orange outline. Inside the head, draw both eyes using small circular shapes. The pupils are made from smaller circles. You can use a triangular shape to sketch the nose while the mouth can be made from two curved lines. You can also draw small lines on top of the head, near the cheeks and on both sides of the body to illustrate some hair. Inside the ears, draw large patches using mostly curved lines. You can also draw another patch inside the head. This patch is located around the eyes and must include the nose and the mouth. A third patch is created on the stomach of this illustration of a hamster. Finally, you can draw small lines inside the hands. step 6 - a hamster is more interesting when filled with colors! 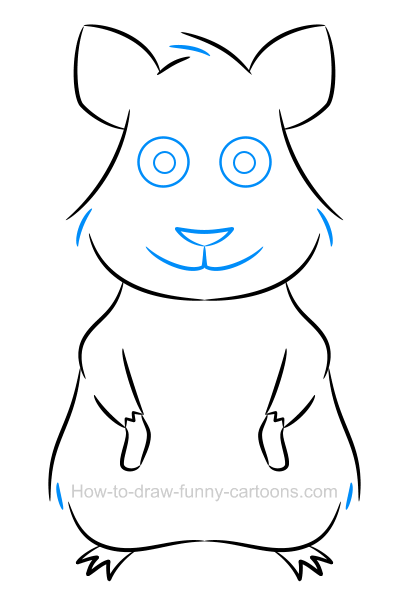 Yes, it's time to bring this cartoon hamster to life by adding bright colors inside the illustration. For the head and the body, a light brown color was selected. All patches visible in this image as well as the hands and the feet are filled with a color similar to the one of the human skin (Caucasian). The pupils and the nose are much darker. 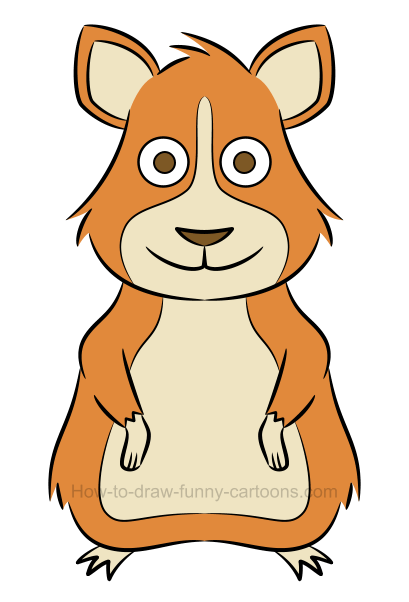 So far we have worked with an illustration of a hamster that was adorable, cute and filled with bright colors. 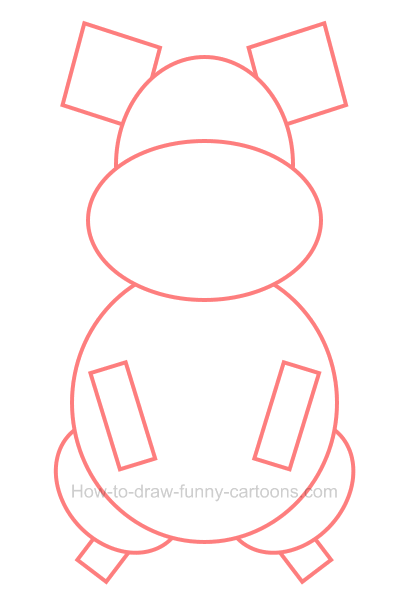 You can see all steps required to draw the character below. In this second part of the tutorial, let's see a few alternatives that are using the same template, but are filled with different colors. In this first example, all patches are filled with the same color used in the original character. However, the rest of the hamster is now filled with a dark brown color. The result is loaded with more depth, more contrasts and more readability. For this second attempt, all patches are now white. The body and the head are now filled with a very bright beige color. This alternative is much harder to read and the character does feel a little ... sick! It's not a bad option, it's just a different version depending on the effect you are looking to achieved. Compared to the original character, this one is featuring patches that are slightly darker. The color of the head and body is also brighter and more saturated. It's another interesting approach that deserves a few tweaks for it to be more appealing. 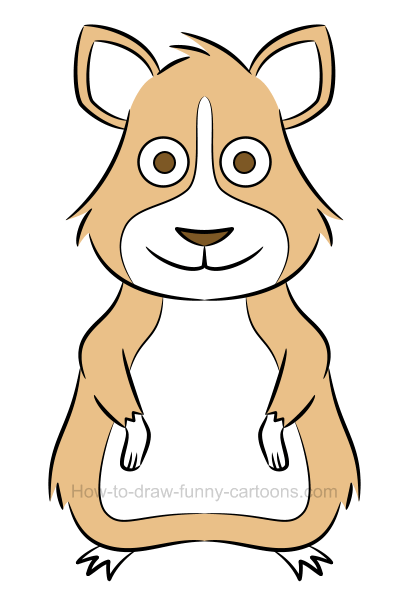 Experiment using this illustration of a hamster! that's the key! In this lesson, we have created only one illustration of a hamster, but this cute character was used to create several more versions. Don't hesitate to experiment when trying to select the proper color for your character. You never know how things will end up. Something can be beautiful in your head, but horrible on paper. On the other hand, an ugly mix can bring new ideas that will lead to something beautiful ... who knows?